andy, wade, joseph,et al., originally uploaded by BikeTinker. There are a couple of things I’ve been missing about Oregon*, and proximity to Portland is one of them. 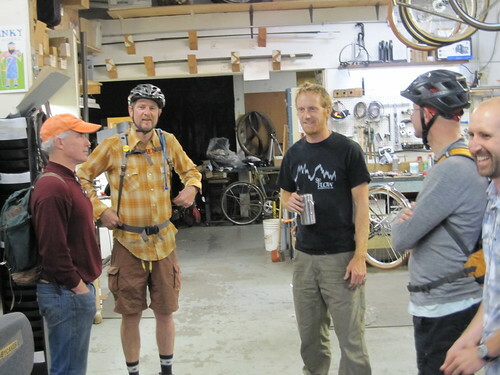 The super happy guy on the far right (really, I’ve never seen him NOT look like that) invited me to the Oregon Handbuilt Show (and secret pre-show Builder’s Ride** – how cool is that? ), but I had to pass, since I’m back in California, and I haven’t saved up a jet-set weekend fund yet. I should have put this up earlier in the week, like when I was home sick, but Sunday is the best day, seriously. *Riding my bike above Rainbow Lake with the dog. Rain. Snow. McMenamins, Powells, Little Big Burger, Floating World Comics. Handmade bike pride. Pretty much everything else is in the “I’m glad I did it, but I wouldn’t trade back” category. Sorry.